Almost 1 in 4 adults in the UK are financially squeezed. We need new thinking that will help more people make the most of their money. 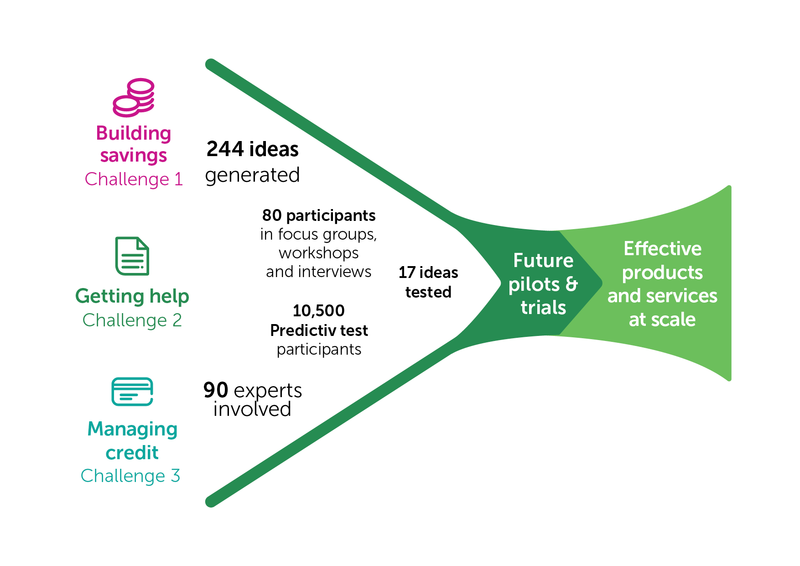 In 2016, The Money Advice Service (MAS), in partnership with the Behavioural Insights Team (BIT) and Ipsos MORI, created the Financial Capability Lab to generate and rapidly test new, behaviourally informed ideas to solve some of the most important money challenges facing people in the UK. The Lab used BIT’s online experimentation platform Predictiv to understand financial behaviour and rapidly test ideas that can improve decision making. Predictiv does this by running randomised controlled trials with an online population of participants, drawn from a sample of over 200,000 adults across the UK. Ipsos Mori conducted qualitative research through focus groups, workshops and interviews to help us explore ideas in depth. If you are interested in learning about the ideas we tested and what we found, please download our Financial Capability Lab Report. For more detail, please see our supplementary Detailed Findings Report. The vision for the Lab is for new solutions to be implemented in the real world, at scale. Solutions based on evidence of what works and an understanding of how people really make decisions about their money. The Lab still has a way to go to realising this vision. The next phase of the programme will be to work with a range of delivery partners to develop some of the most promising ideas into field pilots – delivering and evaluating the effectiveness of these solutions with their customers or employees. We will be engaging with a range of potential partners over the coming months, with the aim of agreeing to a number of pilots to run through to March 2021. If you would like to talk to us about how you can help take these ideas forward, please do get in touch.